Husbands Bosworth has two active community halls. The Turville Memorial Hall is our 'Village Hall' and is situated on the crossroads of the A5199 Welford Road and the A4304 Kilworth Road. Facilities include a full kitchen and servery area, raised stage, multi-functional 'mood' lighting, overhead heating and a seated capacity 'cabaret style', of 80 people. For a more in-depth look at the history of the Turville Memorial Hall, our Village Hall, please click here. To see What's On, view the Diary or for booking enquiries please click here. A more intimate meeting space is to be found at the Refreshment Room of the Sports Pavilion on the Kilworth Road Playing Field. Facilities here include a full kitchen and servery, segregated changing rooms with showers, a referee's room and outside disability accessible toilets. The meeting room is ideal for small parties, family groups and business meetings and can accommodate approximately 20 seated at tables, or 30 free-seated. It also has a French window facility that enables merry-makers to spill out onto the adjacent playing field! For booking information please call 01858 880316. 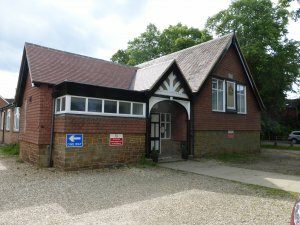 The Village Hall is named the Turville Memorial Hall in honour of the Turville family of Bosworth Hall who donated the land and helped to fund the building of the hall. It was opened to great ceremony in 1895. The Hall is well used and is managed by an active committee.